Keith Schoch is an educator, presenter, and advocate for reading. He shares resources and recommendations through three blogs: Teaching that Sticks, Teach with Picture Books, and How to Teach a Novel. Email Keith Schoch. For some time now, American kids have been crazy about soccer! While the United States seems slow to embrace this sport which is loved worldwide, the first soccer team in this country was actually established back in the 1860s, and the U.S. Soccer Federation was formed in 1913 (joining the world governing body FIFA in that same year). While professional teams and matches still take a back seat to baseball, football, basketball, and even hockey, kids have embraced soccer as one of their favorite pastimes (of the 18 million Americans who play soccer, 78% of them are under the age of eighteen). So it's only natural that we can use kids' obsession with this sport to get them interested in reading and world culture. Enter Nomad Press's innovative Soccer World Series, beginning with Soccer World: South Africa and Soccer World: Mexico . 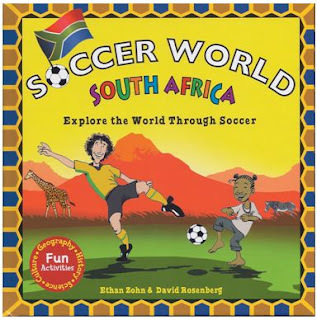 The Soccer World Series follows former pro player Ethan Zohn as he visits different countries, learning about diverse cultures as well as the people who live there. A young player in each country introduces Ethan the nation's unique geography, natural wonders, history, customs, traditions, and sites. In context of these explorations are challenges for kids to act on the social and environmental problems of each country. In addition to the clear and easily accessible text and colorful illustrations, the books in this series also contain key vocabulary, hands-on projects and activities (including recipes! ), and a thorough glossary and index. Students can also visit the series' web site to find additional activities and resources, as well as the opportunity to share their own projects with Ethan. To help get your students psyched about soccer, you might want to encourage some research into its history and rules of play. 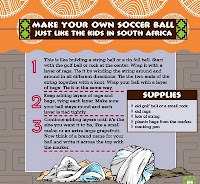 Kids First Soccer is a great place to start, and World Almanac for Kids offer the latest up-to-date information on teams and the World Cup. Speaking of the World Cup, this once-every-four-years event is on for 2010, so what better way to get kids psyched? 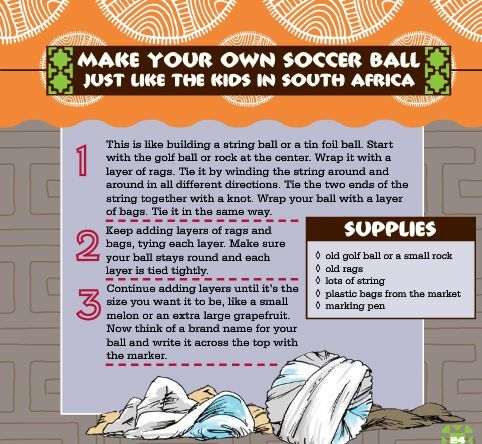 While the FIFA official web site doesn't have a kids' section, you can find some preliminary activities and print-outs at Activity Village. At EFL Club you can find an interesting listening activity involving drawing flags of the 2010 World Cup nations using geometry vocabulary. For dozens of additional links, check out the teacher approved links at the Soccer Section at Edgate. And for lots of free, awesome resources on a number of topics, be sure to visit the Nomad Press site. 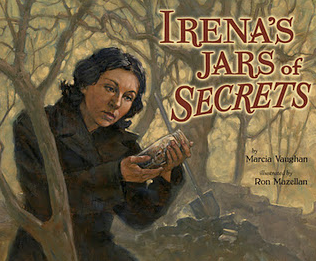 Read more about their titles and downloadable activities at a previous post here. This looks like a very cool series! I know from one of your previous posts that boys like to read about sports, but I can even see my girls getting into this. Just wish we were in school during World Cup.